Sport man and woman jumping up and down on the chair on the gym background during training. Dolly shot. Close up shot of sport fit man making exercises for hands using dumbbells on the stylish gym background. Dolly shot. Concentrate sport woman squating with barabells during personal training with male coach in the gym. Dolly shot. Close up shot. Sport couple man and woman training in the modern gym, jumping up and down on the chair. Dolly shot. Young attractive man and woman jumping up and down on the chair during the training. View from the bottom. Attractive young couple man and woman sit-ups during training in the modern gym. Dolly shot. Caucasian man with naked torso doing push ups during training in the gym. Dolly shot. 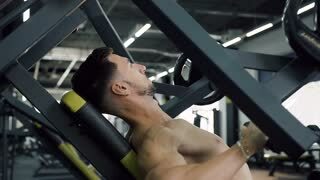 Hard working man with naked torso working out with dumbbells for pumping muscle arms during training in the modern gym. Dolly shot. Close up shot. Dolly shot of attractive young man without t-shirt rub his hands on the gym background. Sport man in the gym.